The conference was striking in its scope and organization. The 2500 attendees were primarily clinicians from throughout India engaged in diabetes care, though there were researchers, advocates, and government leaders attending as well. The faculty represented India and the rest of the world, and the presentations were high quality. I was pleased that the workshop on lifestyle included a good emphasis on prevention, and the Sunday session was packed. It made me happy to see that “mobility breaks” were offered every day during plenary sessions, and some people danced to rock music in the evenings. 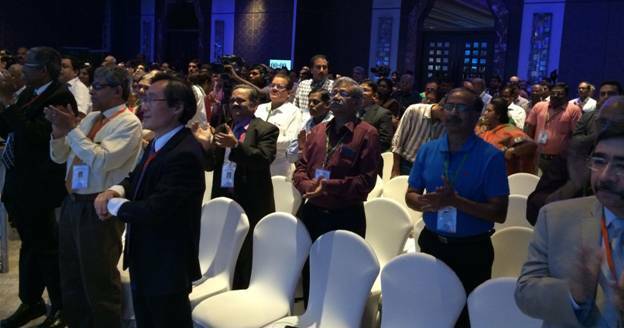 Dr Anjana implemented “Active Applause”, so I was pleased to play a role in disseminating this innovation to India. Of course, the Indian cuisine was outstanding and full of “new” dishes for me, so this was a great example of a healthy meeting. 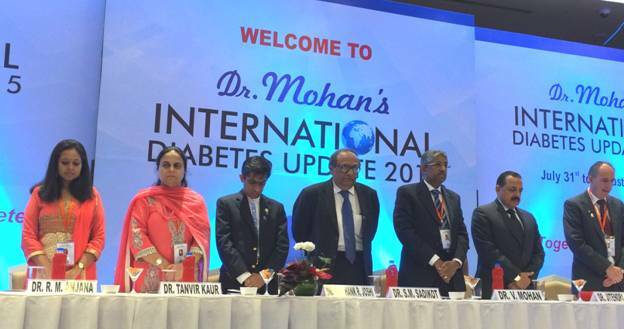 Opening ceremony for Dr. Mohan’s International Diabetes Update, attended by about 2500. The Prime Minister’s health advisor is second from the right. The conference adopted Active Applause. I had several opportunities to meet with the Be Activ India! team, which is the name of the IPEN-related study. They have made rapid progress in preparing for the study, and they have prioritized their data collection schedule to ensure the Indian data are included in the pooled analyses. 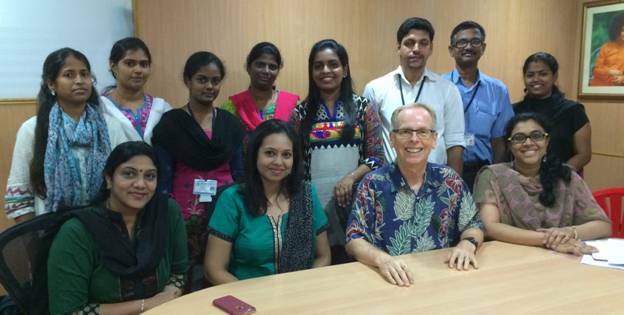 It was a pleasure to meet the large team of talented and enthusiastic team members working on the study. They bring a variety of skills and substantial experience, so I am sure the Indian data will be very good quality. They are using a version of the NEWS built environment survey that was mainly developed by Deepti Adlahka, a doctoral student at Washington University in St Louis. Deepti performed a separate reliability and validity study that was presented at ISBNPA 2015 in Edinburgh. Be Active India! also is collecting GPS data and is planning to use MAPS-Global streetscape audits, in addition to blood and anthropometric variables, so they will have a particularly rich data set. I pilot tested MAPS-Global in a couple of sections of Chennai. 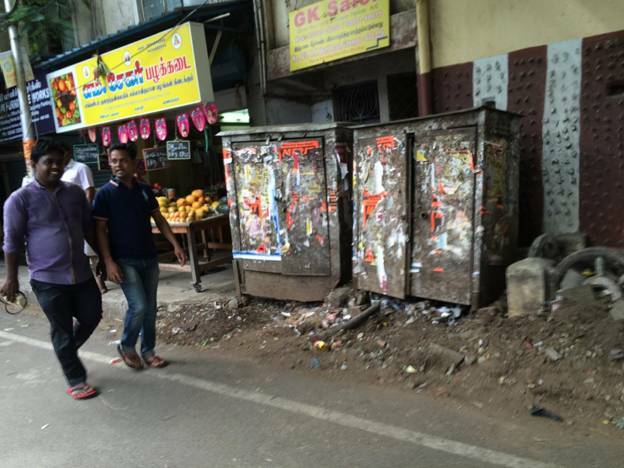 Though it was challenging due to over-stimulation of the Chennai urban environment, it appears MAPS-Global will do a good job of assessing the strengths and weaknesses of the local environments. Most of the Be Activ India! team in Chennai. With me in the front row are Dr Pradeepa, Dr Anjana, and Dr Ranjani. On my suggestion, Dr Anjana organized meetings with local government and community representatives who could be partners in disseminating the results of Be Activ India! and may have the chance to put the findings into practice. We met with a city planner, architects, an epidemiologist in the health department, and leaders of a nonprofit dedicated to social justice and health equity. The planners were pleased to learn about the study and thought the health findings could help them generate enthusiasm for more attention in the government to pedestrians and bicyclists. The group pictured below laid the groundwork for ongoing collaboration, with one possible outcome being an open streets/ciclovia event, which is called “happy streets” in some places in India. Dr. Anjana organized a meeting with city planners, architects, and an epidemiologist from the health ministry. 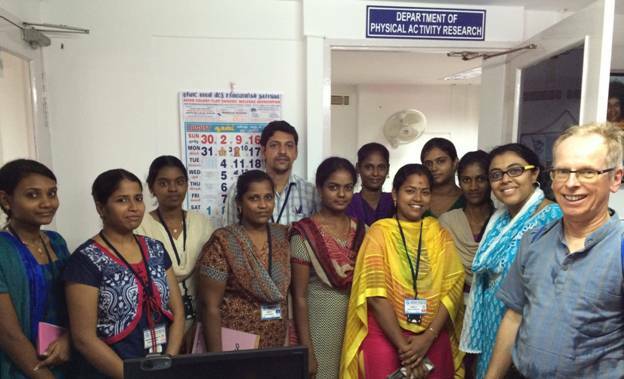 I want to share my observations of the physical activity environments in Chennai. Keep in mind that I was present in this city of over 4 million for less than 2 weeks, and I’m sure I saw less than 5% of the city. However, the general situation seemed to be similar in the other two smaller cities I visited as well. My observations confirmed what our colleagues have been trying to describe. At a macro-level, most places in the city were walkable, in that density was high and land use was highly mixed, so people lived within walking distance of destinations like shops and schools. Though the road network was generally well-connected, the arterial streets presented serious barriers to pedestrians. Many arterial streets were clearly designed to keep cars moving, so there were few traffic signals. There could be miles between pedestrian crossings, and I saw very few overhead crossings. This created dangerous situations because it was common to see people dart across traffic and climb over the traffic barriers or squeeze through gaps in a fence. You can see in the photo below that the main streets are clogged with motorized traffic of every description, so there is no room for pedestrians or cyclists. Cars, motorbikes, and trucks own the streets. It is the micro-level where most of the challenges lie. I had heard that no one walked on the sidewalks, but that was hard for me understand. But I quickly saw that sidewalks are used for everything except pedestrians. There were sidewalks almost everywhere I went, but few of them were passable. Why not? Because cars and motorcycles are parked, hawkers are using the whole space, huge utility boxes and larger trees block the way, trash is piled up, seats for bus stops, and on and on. I just included a couple of photos illustrating the situation, and some videos are posted on my Active Living Clips youtube channel. Because of the sidewalk situation, I saw thousands of people routinely walking in the street. It is clearly dangerous, and it can’t be pleasant. The circumstances seemed even worse for bicyclists. Every day that I read the local English language newspaper, there was at least one report of a bicyclist being killed by a car. Most of the reports described how the bicyclist was at fault, though one had fallen after hitting a pothole. 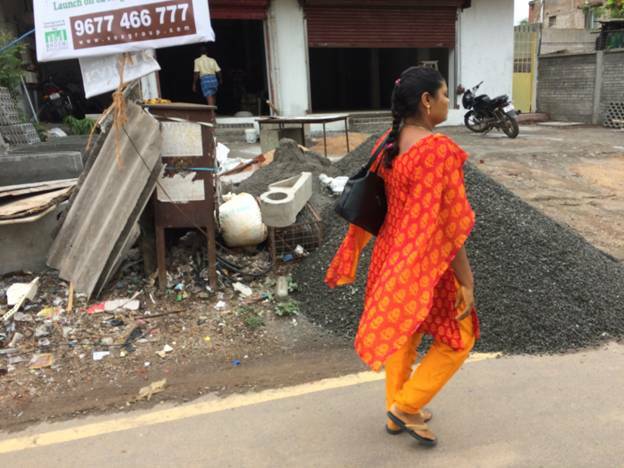 Some colleagues talked about how Indians had grown accustomed to walking on the street, but I did see women walking on the few well-maintained sidewalks that I saw. That suggests people are willing to use good sidewalks. I expect the MAPS-Global data to document the challenges, and hopefully the data will become a tool for advocacy. It will take a major societal change to make a priority of protecting and attracting people to walk and bicycle on well-designed facilities. I understand India is not a rich country. However, the sidewalks are already there in most cases, so a street-by-street effort to reclaim them can start anytime. Creating safe facilities for bicyclists will likely be even more difficult. 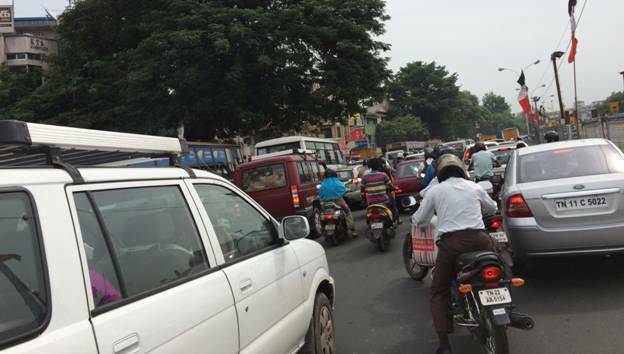 But with India’s roads being full already and hospitals being packed with diabetics and heart disease patients, there is ample justification for a shift from cars being the priority to an increased emphasis on pedestrians and bicyclists. Another illustration of why people can’t use the sidewalks. I want to close by expressing my gratitude to Dr Anjana, Dr Mohan, and the Be Activ India team for making possible my first trip to India. I was inspired by learning more about one of the world’s oldest civilizations. I was stimulated by the chaos of the city, the charm of the people, the colorful clothing, and the magnificent art. I can only hope that our IPEN network can contribute it a small way to rethinking the role of physical activity in India and that I see progress in this direction on my next visit. 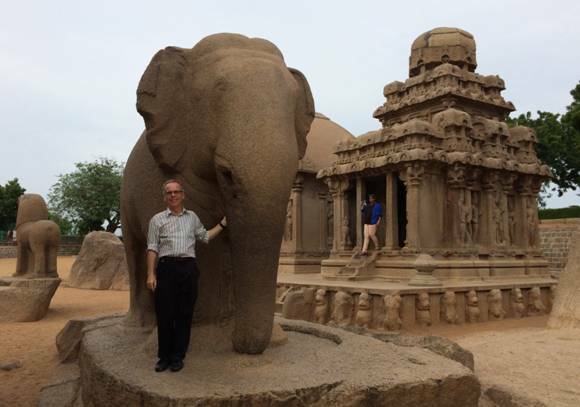 I enjoyed sampling the cultural richness of India. By drjamessallis in Uncategorized on August 31, 2015 .